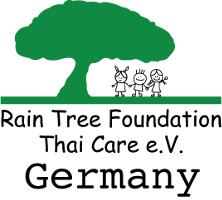 Another concern of ours is to help improve the living and health standards of the children and communities we support. 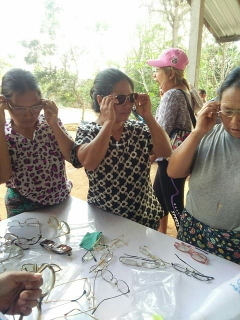 The “give your old glasses a new face” eyeglasses project is a project where donated eyeglasses from Europe are distributed to rural communities in Thailand. Often the hill tribe communities don’t have access to eyeglasses or can’t afford them. This has major consequences for them as they are unable to continue working and restrict them to basic activities due to their limited eyesight. Having glasses and being able to see properly again has a life-changing impact for the receiving person. In the beginning, we went to villages to distribute the eye glasses. Nowadays, we have “centers” where people attend, sometimes from remote places in the mountains, to obtain the eyeglasses. 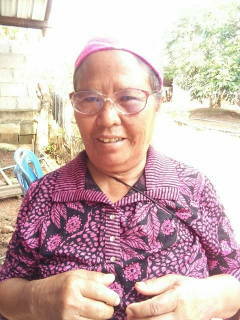 We even try to reach out and distribute the eyeglasses to refugee camps and other distant rural areas. Some of the pairs have even made it to the Sea Gypsy villages in the Andaman Sea, South Thailand. We still need many more pairs of eyeglasses and are looking forward to receiving any of your old pairs to donate to a needy new face. But do not send them to Thailand in parcels or by mail. The eyeglasses are subject to high import taxes according to the Thai Law. You are most welcome to deliver your eyeglasses personally and join us when we travel to various villages and distribute the eyeglasses together. Please contact us if you are interested in donating any old pairs you may have. A lot of the rural communities in the mountains are very remote and medical facilities are quite distant, making it difficult to reach or just not up to appropriate standards. Also the costs are an important factor which may include travel expenses to a clinic or hospital, the treatment costs, and medication. We help to provide medical and dental care in the form of check-ups and distribute de-worming medicine and lice shampoo. We welcome and are extremely grateful to any host doctors and dentists which voluntarily offer their time and skills for the children and people in need.